The requirement for the efficient production of high quality silage is more important today than ever before. Traditional methods of securing silage clamps with hundreds of tyres laid on top of a silage sheet is extremely time and energy demanding upon labour throughout the use of the clamp. Furthermore, the tyres themselves can degrade over time resulting in hazardous material, such as the wire within the tyre, falling into the silage clamp and being consumed by livestock. Stephens Industries Genatex 1000 silage protection sheet is a high quality, woven, polyethylene sheet that provides an easy to use solution to silage clamp protection at reduced cost. 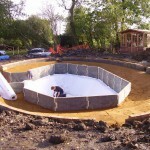 The Genatex 1000 sheet is designed to fit securely on top of the polyethylene silage sheet, held securely in place with the use of gravel bags. 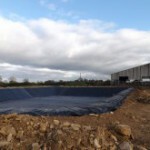 Once fitted the sheet provides excellent protection against bird and animal damage, reduces air spoilage to the silage, and increases silage production efficiency as the highly flexible sheet adapts to the contours of the silage. Due to the woven nature of the Genatex 1000 sheet, wind is unable to lift the sheet, as it can with others, resulting in fewer gravel bags required, while maintaining brilliant strength and UV resistance. For more information, or to get a quote for a silage protection sheet please get in touch.